Here we finally get some better shots of Dhama Suul. I didn’t have him designed when I did the artwork for the first four issues and only got around to designing him before starting the art for issue #5. 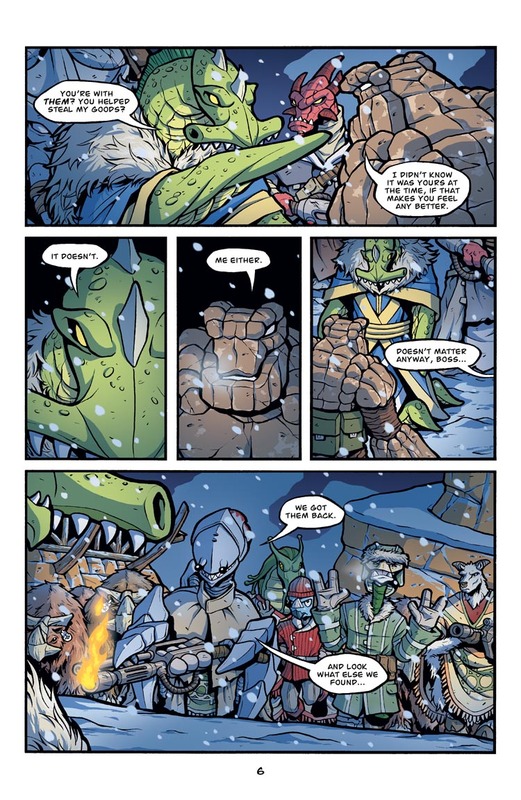 Of course, I had already made Dhama Hes refer to him as a “sawtooth” way back in The Big Snow Job #1, Page 20, so I was kinda bound to work around that! Most of the design work went into the head, which I wanted to look cool, menacing, and, well, “sawtooth”-y. I didn’t bother much with the body design since I figured it’d be mostly covered up anyway. So I’m not quite sure what his actual anatomy consists of as far as the body goes. For all we know, maybe’s he’s made up of two smaller aliens beneath that robe, one standing on the other’s shoulders. That would be awesome. It must be hard being a tentacled alien in the Runners Universe – Sean makes you walk around with your delicate lower tentacles in the cold, cold snow. Looks like everyone is here, except for Bocce and his new friends. I’d say your description of the hammerhead, sawfish, croc, and cthulhu mix is about right. I’ve never been a huge fan of basing aliens on just one instantly recognizable animal, but mixing them up seems to work for me. As a side note, I had not heard of a goblin shark before so I just did a Google search. Yikes! That is one creepy looking freak of nature. Thanks for the nightmares!